Mario has been an icon not only for Nintendo, but for an entire industry. The Italian plumber has been entertaining us for 30 years, showing us the possibilities of both 2D and 3D game design. Super Mario has been the series to introduce people to the platforming genre and at the same time, given veterans something new, yet familiar to experience. For Mario’s 30th Anniversary, Nintendo made the dream of creating our very own Super Mario levels a reality. Super Mario Maker allows us to create our own experience by designing our own levels and playing those created by people around the world. 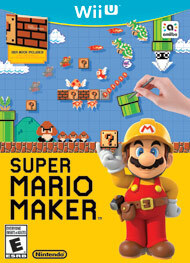 Does Super Mario Maker have the creative spark or is it just recyclable material gone to waste? This is the course maker hub to make your dreams come true. We are no longer restricted to grid paper and our imaginations. With a number of assets and our minds, the game is loaded with infinite replay value. Super Mario Maker comes with an idea booklet with codes to insert in the game’s electronic manual for those who need some help coming up with ideas. The game has four different themes for us to create our courses. 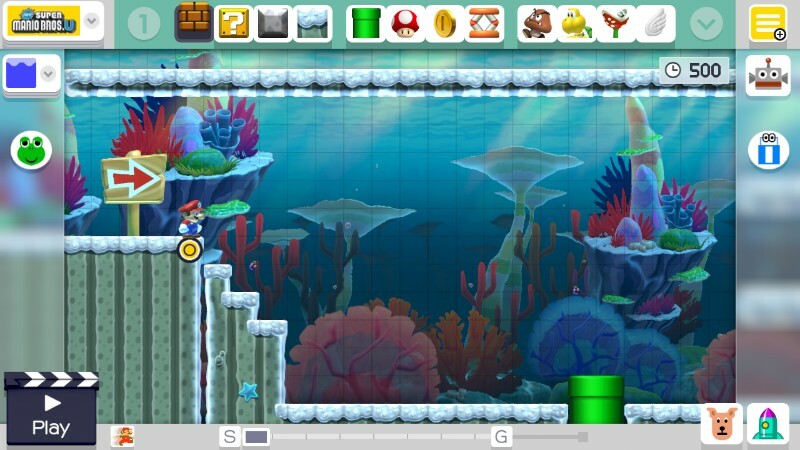 We can create levels for Super Mario Bros., Super Mario Bros. 3, Super Mario World, and New Super Mario Bros. U. Some people will be disappointed to see Super Mario Bros. 2 absent, but I believe it would not have fit well into the game. All the games retain their unique styles and have some unique items. Super Mario Bros. 3 has the P-Meter and Tanooki Leaf; Super Mario World has the spin move and the Feather Cape; New Super Mario Bros. U has wall jumping; and Super Mario Bros. has the same gameplay as before, but gets a nice surprise in the form of Mystery Mushrooms. Mystery Mushrooms are mushrooms that can transform Mario into various characters such as Silver Mario, Nikki, Pikmin, Samus Aran, Link, and many other iconic Nintendo characters. There are many mystery mushrooms to unlock. They can be unlocked immediately with your amiibo or be unlocked by playing the 100-Mario Challenge. The music from the four themes is the same music found in the 2D mario games and there are even new musical scores for themes that weren’t originally in Super Mario Bros. or Super Mario Bros. 3. Keeping the music familiar as before helps the player get comfortable with the game. The levels you create can be uploaded online and shared with people around the world. You can also download other levels to play locally. I spent several hours creating and uploading levels like these for everyone to enjoy. The main meat of the game is Course World and Course Maker. Course Maker is where you create levels with the four themes. There are six backgrounds: Ground, Underwater, Castle, Underground, Airship, and Ghost House. When the game begins, all the assets have to be unlocked by designing courses. Originally, it was going to take nine days to unlock all the assets. Nintendo thankfully released a Day 1 patch to work around the nine-day restriction by allowing us to unlock everything in a few hours. If you want to unlock all the assets, simply use the all the newest assets once and then fill the levels with blocks. Rinse and repeat until all the assets are unlocked. There are plenty of enemies, doors, traps, pipes and other items to place in the level. Access to some assets requires the player to grab an item and shake it. For example, shaking a green Koopa turns it into a Red Koopa and shaking Bowser turns him into Bowser Jr. There are plenty of tricks to use for the levels. Enemies can be stacked, inserted into cannons and warp pipes, and can be fed mushrooms to become gigantic. The assets are all usable across the four games with the exception of a few items unique to each game. 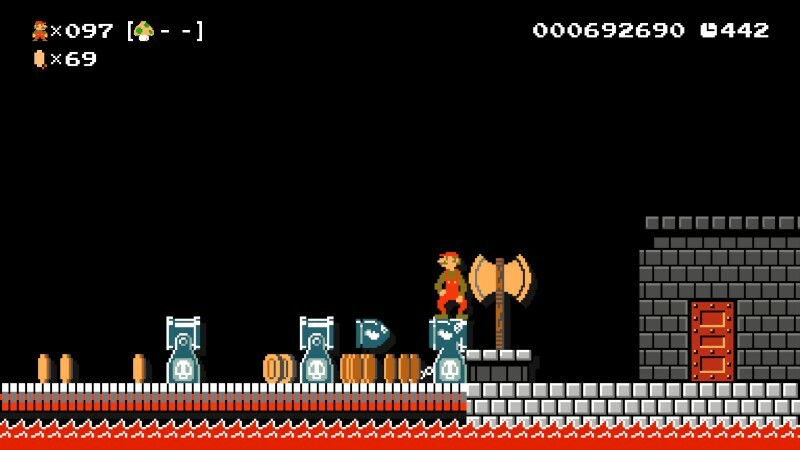 For Super Mario Bros. and Super Mario Bros. 3, new designs for Magikoopa, Wiggler, and other enemies and objects that did not exist in the original games were created specifically for Super Mario Maker. For players who want to use course samples, there is the 10-Mario Challenge. This has players going through eight courses with 10 lives. 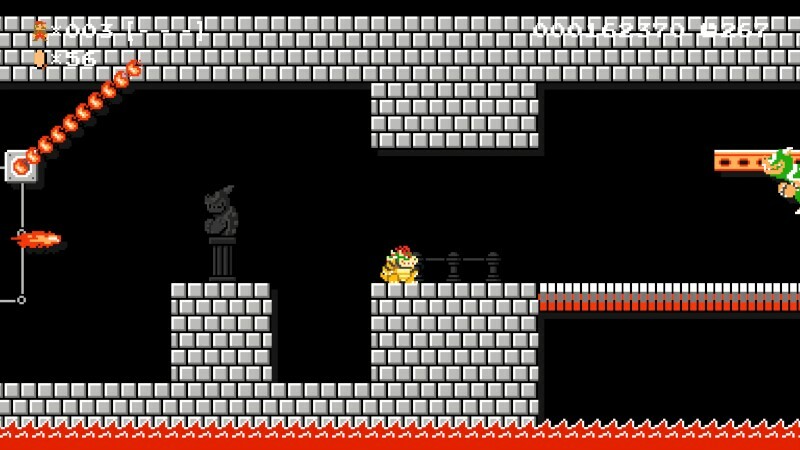 The levels showcased were developed by Nintendo themselves and, again, give players some ideas to use. Every cleared level is added to the coursebot as a sample course to use and tweak. Everyone is able to upload up to 10 levels to the online servers to start. Once you get enough stars, the restriction is lifted. In order for the level to be uploaded online, the level has to be cleared once by the creator. This was a logical move to prevent players from uploading impossible levels. Every level in the servers can be cleared; some are just harder than others. Mario has lost a bunch of weight and gained some height. 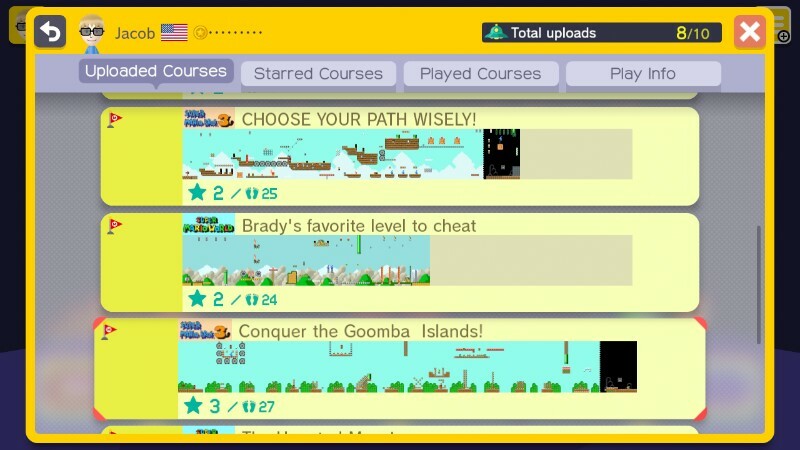 Course World is where players can play levels made by other creators, find levels, and even follow creators. Players can freely play courses by inputting the appropriate code or looking for them in the menus. 100-Mario Challenge is a challenge to clear eight or 16 courses with just 100 lives. Clearing the challenge in easy, normal, and expert will unlock a new mystery mushroom skin to use for your levels. It takes longer to unlock all the various mystery mushroom skins without the use of amiibo, but will also not cost money. The courses for the challenge are randomly selected from the courses created by users around the world. Easy and Normal mode are not too tough. Expert mode is at times impossible if the random selection goes against you and decides to load you with trollish levels. Be ready for the toughest courses and be prepared for anything in 100-Mario Challenge. The good news is if there is a level you do not like, you can simply skip it by putting the stylus on the Wii U GamePad and swiping it away. Hopefully, Nintendo will eventually release a patch to avoid a couple of the meanest tricks such as having an enemy kill you at the start of the level before you can move. Other than some of the cheap designs, the toughest levels are a fair challenge. An important note to remember is after a period of time, Nintendo will delete your uploaded courses. The ones that are rated higher will stay longer while the not-as-popular levels will be deleted. Unfortunately, this system has turned the game into a popularity contest where the YouTube and gaming celebrities will likely never have to fear their levels being taken down while the Average Joe will have to deal with this situation. I’m not saying they don’t deserve to have their levels up longer, but their name recognition gets them stars. I currently see this as a potential issue. Perhaps Nintendo will make changes in the future to make it a bit more fair and maybe add some other criteria to brush away the upload limits, such as putting a certain amount of time into the game or by clearing so many levels made by other creators. Either way, Nintendo is better off fixing the system to give the average person a fair chance to get off the restrictions just like the YouTube and gaming celebrities. Bowser vs. Bowser. Which one will win the princess forever? Super Mario Maker is a fantastic and addictive experience. It is a must-own game for the Wii U and truly captures the same spirit found in Mario Paint back in the days of the Super Nintendo. I have been addicted to the game since I bought it. My other fellow contributors are having a hard time putting it down, as well. Whether you want to create levels to your heart’s content or just want to play hundreds of levels made by other people around the world, Super Mario Maker will be worth the $60 price tag. Your own personal experience with Super Mario Maker will be based on the amount of time you are willing to invest in it. If you want to try out some Super Mario Maker levels from oprainfall, you can find our levels here. If you want new, fresh levels for Super Mario Maker, check out the Make It Rainfall series of articles twice a month. Review copy purchased by the author. The author spent 16 hours during the first two weeks of the game’s release.